Hugely enjoyable British let's-do-the-show-right-here comedy enlivened by strong performances, impressive dance sequences, likeable characters, breezy direction and a witty script. Directed by Ben Gregor, All Stars stars Horrid Henry's Theo Stevenson as Ethan, a streetwise estate kid who lives with his single mother (Kimberley Walsh) and occasionally sells dodgy gear provided by his ne'er-do-well dad (Kevin Bishop). Meanwhile, Jaden (Akai Osei-Mansfield) is a young boy who dreams of being a dancer, against the wishes of his parents (Ashley Walters and Javine Hylton) and when he discovers that local youth space The Garage is going to be demolished, he persuades new-found friend Ethan to help him stage a talent contest-slash-dance-off to save it. At the same time, Ethan challenges a rival dance gang to a dance-off, in order to impress new girl Lucy (Hanae Atkins), so he recruits an unlikely team of fellow youth club members, including martial artist Amy (Fleur Houdijk), over-eater Brian (Gamal Toseafa) and posh twins Rebecca and Tim (Amelia Clarkson and Dominic Herman-Day), and asks Jamal to get them into shape in time for the contest. Theo Stevenson and Akai Osei-Mansfield are both terrific as Ethan and Jaden, sparking strong chemistry together and developing an engaging rapport that works well; there's also strong support from Fleur Houdijk (whose character has a crush on an oblivious Ethan) and their relationship is extremely well handled. On top of that, there are amusing turns from a host of familiar British faces, including Ashley Jensen (as Gina, who runs The Garage), Mark Heap (as the council official trying to have it shut down) and a weirdly unsettling performance from John Barrowman, as Amy's depressed shut-in father. Director Ben Gregor keeps things lively and colourful throughout, aided by Ben Wheeler's sunny cinematography. He also orchestrates some dazzlingly inventive and thrillingly staged fantasy dance sequences, most notably one involving Jaden fighting samurai warriors in a red and white forest and a lovely sequence inspired by The Artist, where Amy dances with her father. Essentially, All Stars is Streetdance aimed at younger children, something the film wittily acknowledges by having a character dismiss Ethan and friends as ‘Glee-Beebies’. However, the script distinguishes itself further by sensitively touching on a number of important issues (children dealing with divorce, children looking after parents, parental pressure, the importance of giving poverty-stricken kids a creative outlet etc) without ever resorting to preaching, sentimentality or mawkishness. On top of that, the witty script is frequently funny and manages to nail all the requisite emotional moments, as well as painting a portrait of the eventual friendship between the group that's genuinely moving. 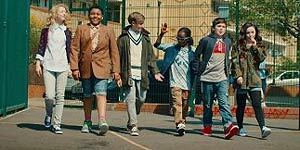 All Stars (3D) is a charming and likeable British comedy-slash-dance movie that should appeal to both children and dragged-along adults alike. Highly recommended.